WASHINGTON – It’s been 23 years since Deputy White House Counsel Vincent Foster was found dead in a Virginia park, setting off one of the biggest controversies of the Clinton administration. Foster, a boyhood friend of Bill Clinton and partner of Hillary Clinton at the Rose Law Firm in Little Rock, Arkansas, was discovered on July 20, 1993, lying in Fort Marcy Park with a fatal gunshot wound. Two independent investigations, the first led by Robert Fiske and the second by Kenneth Starr, concluded Foster suffered a single, self-inflicted wound. A simple suicide. Case closed. But newly discovered evidence unearthed from boxes stored deep in the National Archives lend credence to theories about foul play and cover-up that have been hinted at by at least three books and countless articles. The newest piece to the puzzle was uncovered by two citizen researchers, one of whom was a witness involved in the case from the beginning. What had only been suspicions about missing death-scene photographs are now proven to exist. Rodriguez refers in his letter to photographs showing a wound on Foster’s neck – a wound that did not exist according to accounts in Starr’s official government report. The obvious questions: How could a suicide victim be found with two wounds – a .38-caliber gunshot into the mouth that exited through his head and another wound on the right side of his neck that one of the paramedics described as a small-caliber bullet hole? And why would the government investigators go to great lengths to cover it up? Another question some will be asking is about Hillary Clinton’s embattled presidential run. Can it survive renewed scrutiny into one of the darkest clouds that hovered over her husband’s administration – especially considering her close friendship with Foster and the fact that her aides were seen rifling through files in Foster’s White House office just hours after his body was found? See WND’s “Big List” of Clinton scandals. The newly discovered evidence has actually been sitting, unnoticed or ignored by the media, in the National Archives and Records Administration for years. In 2009, two documents created by Rodriguez were discovered in the archives by researchers Hugh Turley and Patrick Knowlton. But Knowlton was not just any amateur researcher. He was a grand-jury witness who happened to be in Fort Marcy Park the day Foster died and noticed discrepancies that were never addressed by Starr’s report. Allan Favish, a Los Angeles attorney who took a Freedom of Information Act case all the way to the Supreme Court seeking access to photographs of Foster’s body as it lay in the park, said he started looking into the case shortly after Foster’s death in 1993. 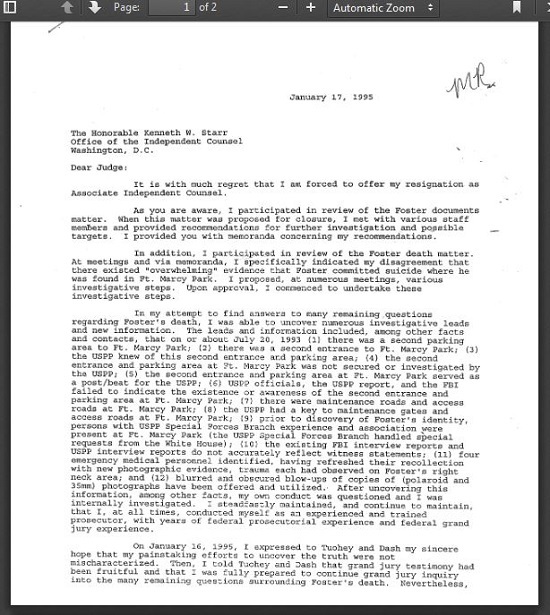 Rodriguez’s resignation letter to Starr dated Jan. 17, 1995, says he was quitting because evidence was being overlooked in a rush to judgment in favor of suicide and closing the grand-jury investigation..
Rodriguez mentioned the existence of original photographs showing a wound to Foster’s neck – the same photographic evidence Favish had been seeking in legal battles that stretched from 1997 through 2004. Favish’s request for the missing photos, filed under the Freedom of Information Act, was ultimately denied in 2004 by a unanimous decision of the U.S. Supreme Court. Read Favish’s brief filed August 2003 at the Supreme Court. The FBI claimed some of the original photos taken by Park Police had been under-exposed and were basically useless. But when Rodriguez found the original images buried in a file, he took them to an independent photo lab used by the Smithsonian Institute and had them enhanced. He was astounded at what they showed. What had once been a blurred spot on the neck, possibly a blood stain as claimed by the FBI, was now clearly something much more. Rodriguez went on to explain in his resignation letter that immediately after he produced the new photographic evidence he came under personal attack by Starr’s staff. He further stated that he reminded one of Starr’s deputy counsels that “only two identical sets of 18 polaroid photographs were provided to OIC [Office of Independent Counsel]. One photo clearly depicts a dark, burnt appearing, blood area on VF’s neck. The D.C. medical examiner who observed the photo stated that, if the picture were cropped and without knowing more, the burnt blood patch looked like a bullet hole or puncture wound. Based on my own experience and training I am confident the traumatized area was caused by a ‘stun-gun’ or ‘tazer’ [sic] type weapon. Rodriguez’s findings from the enhanced photographs were never included in the Starr report. Rodriguez’s memo also raises questions about Foster’s purported motives for suicide – some of which tie in to Hillary Clinton’s roles in administration scandals involving Whitewater and the White House Travel Office. Here Rodriguez gives harsh criticism of the investigation conducted under previous independent counsel Robert Fiske, who had concluded there existed “overwhelming evidence” in support of death by suicide. That was simply not true, according to Rodriguez. “The Fiske counsel report conclusions are not fully supported by the existing record and that the report contains misstatements and supposed facts that are inconsistent with the record,” Rodriguez wrote. 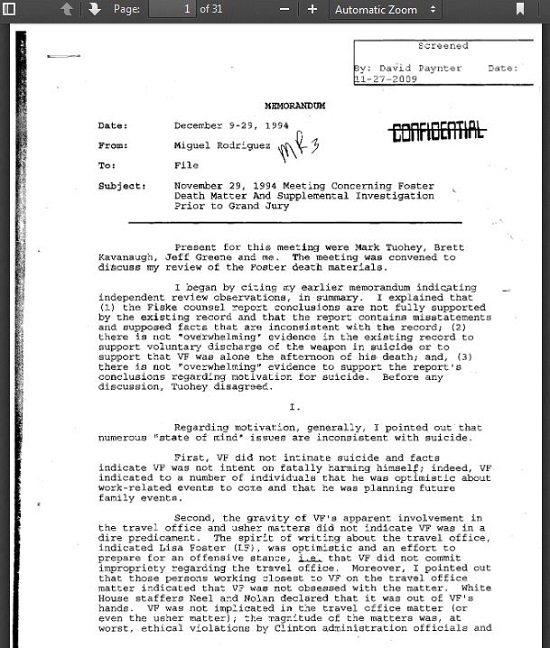 And Fiske’s claim of “overwhelming evidence” to “support voluntary discharge of the weapon in suicide or support that [Foster] was alone the afternoon of his death” was not supported by the facts on record, according to Rodriguez’s December 1994 memo. Tuohey was Starr’s deputy counsel. Starr’s report would end up confirming Fiske’s contention of “overwhelming evidence” in support of suicide. Rodriguez also questioned Foster’s motivation for committing suicide. Reports that Foster was receiving medical treatment for depression were greatly exaggerated, Knowlton told WND. His doctor had prescribed over the phone a low dosage of the anti-depressant Trazadone, which at the time was commonly prescribed as a treatment for insomnia. In his December memo Rodriguez identifies then-First Lady Hillary Rodham Clinton as “HRC” and Vince Foster as “VF” and describes a conversation the two had about the White House travel office, which had come under a cloud of suspicion in the media. Support the Hillary Clinton Investigative Justice Project. Hugh Turley, a Maryland resident and independent researcher, met Patrick Knowlton at a conference some months after the Foster death and discovered they had a mutual interest in the case. They started comparing notes. With the assistance of attorney John Clarke, they filed Freedom of Information requests for documents produced by the various attorneys investigating the case for Starr. It was Turley, Knowlton and Clarke who authored the 20-page appendix attached to Starr’s final report, issued in October 1995. Starr did not want to include the appendix but he was ordered to do so by a three-judge panel of the D.C. Circuit Court of Appeals. Turley told WND he believes the biggest story to come out of the Foster case is the failure of the American press to report on the appendix, which unravels the Starr report piece by piece. “We wrote the appendix, that the D.C. court ordered Starr to include. He asked the three-judge panel not to include it and they said ‘sorry you have to include it’ and so we literally wrote the final 20 pages of his report, and we’re as much an expert on this case as Ken Starr,” Turley said. Those 20 pages contain evidence of an alleged cover-up, grand-jury witness intimidation and criminal activity by Starr’s own staff. Turley and Knowlton have placed all of the documents on their website, FBIcover-up.com. Included are reams of official government documents, timelines, photos, and audio recordings of Rodriguez in which he states his belief that his investigation was thwarted by a cover-up. WND was, in 2003, the only news agency to report Rodriguez’s claims made on the audio tapes. In that 2003 report, Rodriguez is quoted saying he did extensive interviews with major newspapers, including the New York Times, that were never published. The evidence of the neck wound is listed as Exhibit 5 in the appendix to the Starr Report. “After telling you they have the complete report they admit they haven’t given you the whole story,” Turley said. Knowlton, reached by phone Thursday night while cooking moo shu pork at his apartment in New York City, said he remembers vividly the scene he encountered at the park that summer day more than two decades ago. He pulled into the park to relieve himself about 4:30 p.m., just 70 minutes before Foster's body was discovered. He saw only two cars in the parking lot, four spaces apart, and parked between them. He called the U.S. Park Police the day after to tell them what he saw but was never contacted. "The initial Park Police investigators didn't even interview me. Then the Fiske Report pulled in some other people, and I was pulled in [nine months later]," he said. "The Fiske Report was really a whitewash. It said I had no recollection of the color of the car, which was just totally wrong. So those really were not investigations." He reported seeing an unoccupied rust-brown Honda in the parking lot with Arkansas plates. Foster's car was a grey Honda, leading Knowlton to believe Foster's car was not at the park where his body was found. 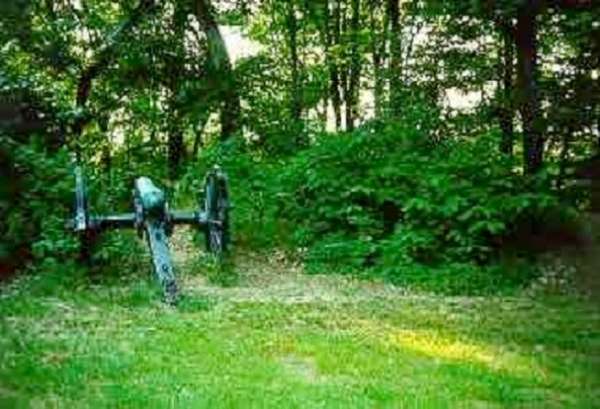 Fort Marcy Park in the summertime. The car was just one of the many discrepancies that Fiske and Starr chose not to report but are included in the 20-page appendix. Another oddity is the lack of an X-ray of Foster's body in the autopsy report. "Once the office [of the independent counsel] closed, Hugh and I filed FOIA requests and started going through boxes of documents, hundreds and hundreds of boxes," Knowlton said. "It takes a long time." They found the Rodriguez resignation letter around 2004 and posted it on their website a few years later. "And why nobody's touched it, I don't know," Knowlton said. "We don't go to the press and say 'this is what we have,' because nobody cares," he said. "We have maybe a thousand hits a day at our site. Those people know the truth." "I spent 20 years, seven solid years, where every day we were taking apart that Starr report. One of the things I find pretty astonishing that nobody's ever reported is we took all that information from the government records and when Ken Starr's report came out I think he had to be pretty shocked that we came out and countered, refuted, almost everything they said. We never saw his findings ahead of time, but we were able to pull together all the evidence of a cover-up and produce public records to support it." WND reached out to Miguel Rodriguez, who is now a U.S. attorney in Sacramento, California, but the calls were not returned. Hillary Clinton's campaign staff was also contacted Friday but did not respond. Knowlton also reported in the appendix to Starr's report about repeated acts of harassment and "intimidation" by what he believes were agents of the U.S. government. Up to 25 "well-dressed men" approached him on the streets of Washington, glaring at him and pulling on their coat sleeves. He said these strange encounters were witnessed by several others including his girlfriend, his sister, a reporter and his attorney. "This is more a story about the press covering up than anything else. They attacked me. Why would you do that?" he told WND. "I came forward the next day. I had nothing to hide. To turn on me and say cruel things to me, and then to get harassed by the FBI, why wasn't anybody reporting on that? The whole think is mind blowing to me. It takes me back to JFK and what happened with that. I blame the press."